With an increase in global populations and more people entering the aquatic home of one of nature's oldest predators, shark attacks continue to climb each year. George H. Burgess, director of the Florida Museum of Natural History's International Shark Attack File (ISAF) said there are a few ways to reduce the risk of an encounter. Most shark attacks are not lethal and can be classified as shark bites. 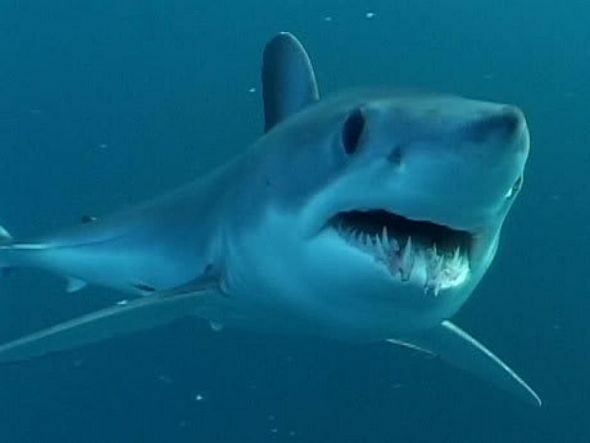 "These are hit-and-run attacks," Burgess said, adding that sharks often mistake a person for prey, take a quick bite, realize their mistake and let go of the victim leaving injuries that may be no more serious than a dog bite. Even though most attacks do not result in fatalities, several people still die because of shark attacks each year. Swimming or surfing should be avoided in the early morning hours and as the sun begins to set, according to the ISAF. "Many sharks are most active at these times and are better able to find you than you are to see them," the ISAF reports. When you do enter the waters, it's important to stay in a group of people if you can as most shark attacks occur when people are alone. Wandering too far from the shoreline can also pose a risk as it "isolates you and places you away from assistance," the ISAF reports. Rings, necklaces, gold chains and other reflective, metallic jewelry may confuse a shark into thinking they've spotted a food source. "Leave the jewelry at home," Burgess said. "The light reflecting off it makes it look like the light off of fish scales." Also read: How Much Should Parents Borrow for Their Kid's College? According to Burgess, most of the "hit-and-run attacks" occur as a result of the shark mistaking a person for prey. Most commonly surfers experience this type of attack because of their splashing and paddling movements that are similar to the movements of fish. Sharks are attracted to erratic movements and splashing. Another risk that can increase the chances of getting attacked may be the designs or colors of a bathing suit. Sharks have excellent vision for hunting their aquatic prey and will be able to see brightly colored clothing even in cloudy waters. "Sharks see contrast particularly well," Burgess said. "I'd advise against wearing bright colors." Sharks, sea birds and anglers all hunt the same prey, so avoiding waters where fisherman are luring in a catch can help reduce the risk of a shark encounter. In addition to avoiding waters that are being fished by anglers, ISAF reports that diving sea birds are also a good indicator of fish in the area. Avoiding to enter waters with sewage output is also important because sewage can lure bait fish into an area. Sand bars and deep dropoffs are also favorite areas of sharks, according to the ISAF, which stressed using caution in those areas. One of the most powerful senses the shark possesses is its sense of smell. Sharks are capable predators and can detect the blood of injured prey. A good way to reduce the risk of attracting a shark is to stay away from the sea with open wounds or cuts that could attract them. If a shark does attack, Burgess recommends fighting back and doing everything to get out of the water as quickly as possible. "It's important to be proactive," Burgess said, citing the need to fight back. Punching or swatting the shark in sensitive areas like the nose may be an effective deterrent, but the tactic won't work forever, he added. 0 Response to "5 tips to help avoid a shark attack"